Frenkel Topping Group Plc (LON:FEN) Chief Executive Officer Richard Fraser caught up with DirectorsTalk for an exclusive interview to discuss what the company has done over the last 3 years and its plans for the next 5 years. Q1: Richard, can you give us a bit of an overview of what’s happened to Frenkel Topping Group over the last 3 years? A1: So, as the business was growing from 2004 when we floated on AIM, it had consistently year-on-year increased the operating profit by the income added on by our assets under management and we’ve slowly grown those assets to approximately £600 million by 2015. As the business continued to grow, we realised that if we were up to manage the assets in the right way and make a step change in the business, we really need our own discretionary management function. So, in October 2016 we bought a company that gave us discretionary permissions and we set up our discretionary management business which is now branded as Ascencia Investment Management. Throughout 2016, we embarked on a suitability exercise so what that basically means is we went out and we reviewed all our clients to see whether they would be suitable to go into our own in-house discretionary management service. At that point in time, at approximately £600 million, we transferred into the DFM approximately £200 million so that proved to the FCA we were not shoe-horning clients, we were doing it the right way. What it meant for the business was we were now earning the additional income on that £200 million which would otherwise have gone to external DFM’s and that meant that at the end of 2017, we’d increased the operating profit to circa £2.2/£2.3 million. We had looked, at the start of 2017, a potential strategic partner for the business and we had gone out and talked to a number of different larger investment houses and that process led us to believe that actually we didn’t need a strategic partner if we made the right investment into the business. Then the goals and the strategic objectives we had, we could meet ourselves without actually going into partnership or being bought by somebody else. So, during 2018 we made some significant decisions, first being that we increased our marketing spend quite dramatically, overhauled all of our marketing collateral, the look and feel of the business, the different individual parts of the business. We embarked on a graduate training programme, so we now have 8 graduates in the business along with trainee financial consultant, we’re effectively training our talent for the future. In our world, in personal injury and clinical negligence, which is where our work comes from, from lawyers and barristers, we’re quite unique. We need financial advisers who are expert witnesses so they act as forensic experts, pre-settlement of any case, where a lawyer would need a financial expert to do maybe a loss of earnings report, a pension loss report or an accommodation report. Having done that as a pre-settlement, once the case is settled and the claimant has got their £2 million, £3 million, £4 million in damages, they’re then able to go into a home of a brain-damaged individual, a cerebral palsy baby, somebody who’s got a spinal injury and have the emotional intelligence then to be able to win that client and the mandate to manage their assets. It’s a difficult individual to find so we took the decision to invest in the future, invest in people and start the graduate scheme. We also invested in technology and platforms and IT so circa last year we probably invested £1 million into the business in various aspects to put the business in a position where we felt gave us the platform to then take the business forward. We’ve hit our numbers in the marketplace for this year, the numbers are out there in from FinnCap who are our brokers so we’re all very confident, we’re actually going to be putting a statement out shortly, an update of our trading. So, we’ve positioned ourselves to now look forward to the next 5 years and to look as to how we then achieve our goals and ambitions. Q2: We’ve seen where you’ve come from, where are you going? You mentioned your 5-year plan, can you explain that to me? A2: If we do nothing differently, from an organic perspective, then the business will double in 5 years, we will double our turnover, we will double our operating profit and we’ll double our AUM. Overlaying that, we believe now that where we’ve got to with the infrastructure in the business, we’ve got the opportunity to embark on an M&A strategy which we’ve been doing through 2018. We’ve got a number of businesses that we’re looking at in the IFA community that would complement what we’re doing in the core business and the IFA’s struggle with the same thing that everyone else does. We’ve got increased compliance, the cost of that, we’ve got the senior managers regime coming in later on this year in December so the additional costs of compliance, the cost of marketing branding, IT, business development, all the things that a small IFA struggles with and on top of that, sees and manages their clients. So, we’re looking at a number of businesses that have got anywhere between £100 million to £200 million in assets under advice, they’re not big enough to set up their own discretionary management arm, as we were, and recognise that the cost of that is prohibited. So, we feel that having put the business in a great place from an infrastructure point of view, we can now offer these IFA’s a home, we’re not a consolidator so we’re not looking to buy assets in and consolidate. We’re looking for genuine owner-managed businesses who are looking to how they can develop their business over the next 5 years, give them some central functions like marketing, compliance, HR, accountancy functions and also, with the DFM offering, help to increase income and profitability into their businesses. So, if you overlay that M&A strategy on top of our organic plan then we can really grow the business in the next 5 years. We’re £800 million now in AUM, we would like to get to at least £2 billion in 5 years so we’ve got quite an ambitious growth plan which will then get the subsequent growth in the probability of the business. I think it goes beyond that, in that we’ve also got some clearly defined corporate strategies for the business. The first one being is that it’s just excellence in everything that we do, we want to make sure that right from the bottom to the top that we are seen as a company that provides the advice to clients in a form that is just right up with the best of the business. I got a kind comment from somebody who came into my business and they said our receptionist greets him with a smile and he loves coming to Frenkel Topping because he gets the best cup of coffee in Manchester. That’s right from the receptionist, you put all that weight right through the business and you have a culture then in providing that excellence. The second point is that we do, for the personal injury and clinical negligence field, look after clients who have had something catastrophic happen to them and everybody uses this word ‘vulnerability’. I don’t like that word, how I prefer to describe it is that in a position like that, somebody has been put in a position where they are, through no fault of their own or circumstances have decreed, frightened of being taken advantage of. You can actually apply that in many many other different situations so a divorcee who suddenly has to have a pension share order and split their pension, someone selling their business, someone at retirement, I think you could apply that across a whole number of different situations. We want to take what we’ve done in personal injury and clinical negligence and build again that culture through the business. I fundamentally believe that for individuals, your family and friends are the most important people in your lives but after that if anything happens health-wise, your doctors and surgeons are the most important advisors you have. Again, I then believe your financial adviser, you IFA, is one of the most important advisers you will ever have because they sit at your right hand in all the major financial decisions you make in your life. That could be your mortgage, protecting your family, accumulating wealth up to retirement, decumulating that wealth post-retirement and being able to cascade that wealth down to the generations to mitigate inheritance tax. So, I fundamentally believe that an IFA plays a very important role, I think we’ve got a bad reputation because of what’s happened over the last 20/30 years. 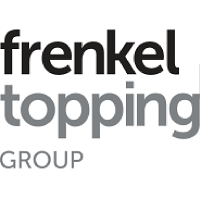 What I’m looking to achieve is to promote Frenkel Topping Group as a company that believes in the integrity, independence, transparency and importance of the work we do. So, in the next 5 years, we want to really push out the Group to put us into the marketplace to stand for something that is along the lines of the pillars that we believe in. The third strategy is we want to transform the business into a digitalised company fit for the 21st century, I still don’t think, particularly in the IFA marketplace, that we do enough to interact with clients in a way that enhances digitalisation. I use my iPhone, my iPad, I don’t get a statement through the post now, everything comes through my iPhone, we still use far too much paper in our world and I just feel that we can utilise technology to give the client a far better and more efficient service. The fourth thing is to continue with our graduate programme and apprentice programme and continue the education and continue to develop the talent for the future, to develop the IFA’s and the paraplanners for the future. I think the last thing for us is social responsible investing, I don’t know if you’re aware, there’s the United Nations decree of Positive Impact investing that has 17 points so for example, one of them being for education so a company that would fit in with that would be Lego because of the way their products help educate children. So, you can have positive impact and the negative impact being gambling, tobacco alcohol, oils, that nature. I just think part of what we do I think we have a social responsibility to make sure that when we’re looking at our investments for clients, we have that in mind. To be honest with you, if you look at the returns that the social responsible investing gives you, they’re very much on par with a traditional portfolio and in a lot of cases, giving you better value and better returns than a more traditional portfolio. If we overlay those five strategy goals on top of our organic and M&A plan, then the business is a really really exciting place to be. I think that we can deliver shareholder value, we can increase the profitability of the company, increase the share price and continue to pay the dividends that we’ve paid out historically. It’s very exciting at the moment, there’s a lot going on in the business. We’ve set ourselves out, we’ve done all the hard work, we’ve got the infrastructure, we’ve got the foundation in place and I believe, in the next 5 years, we can create a business that is going to be one at the forefront within the independent financial marketplace.